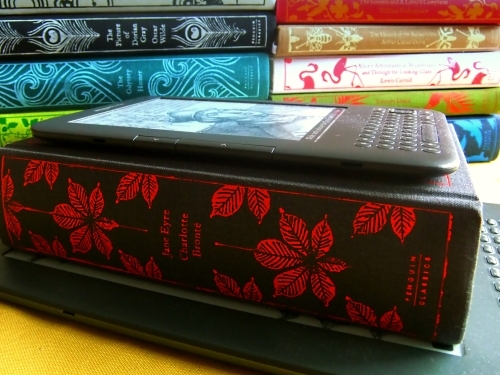 Should You Get a Kindle if You’re a Book-Lover? I love books. Always have done. I could read before I started school (thanks to my mum!) – and I spent my childhood and early teens with my nose in a book. But then two book-loving acquaintances got Kindles: Tony Price (former librarian, current vicar) and Lorna Fergusson (author and creative writing teacher). I began to rethink the whole ebook thing. And now, our household has not one but two Kindles, and I’ve got my beady eye on the newly-announced Kindle Fire. The Kindle on the top is the newer model (Kindle 3) in standard size. The Kindle on the bottom is a bit older (Kindle 2) in the DX size. My main worry with the Kindle was that it wouldn’t feel like reading. After all, I don’t particularly like reading long texts on the computer. Rest assured, it becomes perfectly natural after just a few pages. Once I’m into a book, it doesn’t make much difference whether I’m reading it on paper or on the Kindle – it’s the story that matters. The Kindle also keeps your place automatically – very handy. If you travel even a couple of times a year, you’ll find the Kindle very handy. Not only can you take as many books as you want, you can also buy books on the go. And you can keep music or audio books on there (there’s a headphone socket on the Kindle) if you want. Unlike all my other electronic devices, the Kindle has a long enough battery life to easily last through a 10-hour plane trip. So long as you turn off the 3G/wifi connection, your Kindle will give you hours of reading time without needing a recharge. If you get the 3G version of the Kindle, you get worldwide internet access. That means that you can download books from anywhere – but it also means you can use the Kindle’s (admittedly rudimentary) web browser. This is incredibly useful if you’re in a hotel without wifi, or out and about, and you need to look something up quickly. You can even tweet from the Kindle! Books that are out of copyright (70+ years after the author’s death, in the UK) are freely available to download straight from Amazon. These include classic books by Jane Austen, Charles Dickens, George Eliot, and so on. If you look at the Kindle top 100 bestsellers, you’ll see lots of books priced at under $5. Some are just 99 cents. You might be able to pick up books that cheaply at second-hand sales locally, but the Kindle offers a lot more convenience and choice. A fair percentage of these cheaper books are self-published by (increasingly net savvy) indie authors. There’s no overhead for the publisher, so the reader gets a great deal and the author actually nets more royalties per book. You can also transfer files from your computer – so if you have a book in PDF form, you can put it onto your Kindle. Precious little! Mine is a Kindle 2, so I wish it was the newer, smoother, model. 😉 I’m also not sure that DX was the right choice for me – I thought I’d be reading more PDFs on it, but in practice, I’ve mostly just read Kindle books. I’d like a better web browser, but, in fairness, that’s not really what the Kindle’s designed to do, and I’m grateful that it has a web browser at all. So … should you get a Kindle? If you love books, I’d say a definite yes! You’ll find yourself buying and reading more books, and quite probably expanding your reading tastes – it’s easier to try something new when it’s cheap (or free!) The Kindle is relatively cheap (compared with, say, an iPad…) and if you have more than one Kindle in your household, you can even read the same ebook at the same time. There are several types of Kindle, so I’ll try to make the choice a bit easier! Go for a 3G Kindle if you’re going to be travelling with it (even just commuting). Note that, in the UK, this means buying the keyboard version. You can see the range of Kindles on Amazon.co.uk here (scroll down a bit to see the comparison chart) and on Amazon.com here (again, scroll down). Disclaimer: I’ve not tried the new keyboard-less version of the Kindle. I don’t type very much on mine, though, so I imagine that using the on-screen keyboard would be fine. And if you don’t want to fork out for a Kindle, remember that you don’t need to own a Kindle in order to read Amazon’s ebooks. You can download Kindle apps for your iPad, iPhone, Android or even your PC too. If you own a Kindle, I’d love to hear your take on all this in the comments. And if you have a different type of ereader, let me know how it compares with the Kindle! Note: Links in this post are affiliate ones. Photos are by my husband. Thanks, Ali! I also love books, not just reading but the booky-ness of books, so I was a slow convert to the Kindle. I’m not sure if the keyboard-less version lets you do this, but I think all the others do. Jennifer Kentmere’s last blog post ..Should a Freelancer Build a Blog? I am addicted to the dictionary feature and really miss it while reading tree books. Gwen’s last blog post ..Sunday Salon- The Kindle is Winning and The Pumpkins Are Taking Over! Great point! I’m clearly not reading very erudite books … haven’t had much use of the dictionary yet! Glad you enjoyed my reading list, Jackie! 🙂 I tend to take a book — or now my Kindle! — whenever I’m going somewhere. I too hate being without something to do if I get delayed. I ended up really loving the silly thing. Ah, guidebooks is a great point! We put various useful documents (like all our check-in information) onto my Kindle while travelling … and if we’d been doing it for longer, we’d probably have invested in some guidebooks too. I own two Kindles. I first got the large DX one because I thought it would be good for PDFs (haven’t read more than a few on it after two years) and because I thought it would be more convenient to change pages less often, then I picked up the smaller version last Christmas. I love both of them for different reasons, but if I had to choose one, I’d take the smaller one as it’s much more convenient (lighter, smaller) when travelling. I prefer my Kindles to real books now because I am an American living in rural Italy and English-language books can’t be found around every corner…so I download sample of books that catch my interest and buy those that keep it. I also love the fact that I can read on the Kindle without my glasses by controlling the size of the type. I don’t have a Kindle; however, you provide compelling reasons as to why I should get one. 🙂 If I don’t get one for Christmas, I may splurge and get one for myself.We’ll see. I too love books. The feel of them, the smell, and the look of paper. Yet I’ve had a Kindle since the beginning (and I’m still reading with the 1st generation) and I love it. I originally purchased it for work. I’m a book editor and I get hundreds of manuscripts emailed to me. It was costing me a fortune to print them all out (not to mention all the trees being wasted). At the time the $300 price tag was equivalent to my printing 15 manuscripts, so it made sense economically and environmentally. I thought I’d only use it for reading manuscripts to determine if they were something we’d like to publish. But I now use it for a lot of my personal reading…especially when I travel. No more overweight luggage. And I purchased a waterproof sleeve for it so I can even read while floating in the pool. And the keyboard makes it easy to take notes while reading. I love my Kindle. It has made reading for both work and pleasure easy. As for keeping up with blog reading, I rely on my HP Touchpad. Karen, I’ve done the same thing with manuscripts and works-in-progress from friends and clients (though thankfully I’m not in the position of having hundreds to read!) A waterproof sleeve is a genius idea; I’ll have to look into that one! Get one and don’t ever look back! I’ve got a kindle 3 and it’s been absolutely wonderful! I’ve got more books than I could read in a long while already download, and I keep it in my briefcase so I can read whenever I have a spare moment. I definitely agree that most of the tactile complaints are mostly negligible, and the pros are amazing. The fact that they’re so flat is really helpful for bags/briefcases/etc! I got a Kindle 2 for my daughter who loves to read and she even discourages me from getting her the newer version. She loves hers and kept telling me that I should get one. It took a while. Yes, I’m a book lover, and I still enjoy reading regular old physical books, but I wouldn’t be without my Kindle. I own a Kindle 3.1, which is the keyboard model that amazon claims holds up to 1500 books and with a one-month battery charge (not using the lamp). I also bought the leather case with the pull out reading lamp. And I would buy both again, although I would of course get the newer version (have not tried the touch screen or Fire versions. As you pointed out, you can haul around a tremendous selection of books in a small and light package. I take mine whenever I go places when I am likely to have to wait, like a doctor’s office and any government agency! I like the better prices and the freebies. I use the reading lamp a lot. Since the screen is not backlit, having that lamp makes for more comfortable reading in low-light areas. I love that I can change the type size for comfortable reading. At almost age 70 now this helps! I also use the PC version frequently. I find the Kindle keyboard awkward and frankly a pain to use. So I like searching, hiliting (all of which I do a lot! ), and making notes via my PC. When I download a book, I download it to both my Kindle and my PC Kindle–so I can go either way. I especially enjoy late in the evening getting cozy in my bed are reading on my Kindle. The page is slightly off white and the type is dark in contrast, so the reading is easy on my eyes. Plus it’s lighter that a lot of books, particularly large ones. 1. A separate small, thin, plug-in keyboard easier to use would be wonderful. 2. The charging port is on the bottom edge, which makes it awkward to read while charging (I often rest my Kindle on my tummy). 3. Searching and leaving through a book could be improved. Sometimes the search capacity doesn’t work well; other times it’s fine. page turns, are way to easy to accidentally hit and turn a page when you don’t want to. I have to get to a local store and check out both this color version and the new touch screen model. Overall, if you read a lot, I highly recommend a Kindle (but keep in mind it is the only electronic portable reader I have tried), especially at the latest low prices. The convenience and readability are awesome. And,Ali, I’m still enjoying your freelance online course. Great summary here, Bill! I agree with you that a separate keyboard would be fantastic — perhaps this is something Amazon will do in future. The Kindle is a great tool for reading ebooks and this seems to be what I read alot lately. The thing I would say I like the most about my kindle is that it’s lightweight and flexible. I consider myself a light traveler but when I do travel I only take my kindle and no other physical books. I recommend anyone who doesn’t have one to give it a try. It’s brilliant for travelling light; I’m sure more and more frequent travellers will be getting Kindles in future! It’s funny, I got the Kindle more because of the 3G (my internet is spotty at times in this rural area and can’t afford a smart phone data plan) and ended up falling in love with it as an actual reader. I love that I can convert anything and have it handy on there. The last few months, I have been working on a story outline and being able to convert my word doc of my notes has been a huge help and the fact that they are then searchable is an incredible bonus! Cookbooks- my regular cookbooks are a pain to search through and tend to get speckled with food when being used. On the Kindle, not only can I search them all at the same time, but with it’s case, I can stand it up close enough to read, but far away enough that it doesn’t get dirty. When I wanted to make pickles last month, I just searched pickles and it gave me the recipes from all cookbooks on there, for example. Also, I never lose my page while measuring, stirring, mixing etc. That’s interesting to hear: the 3G was definitely a selling factor for me, but not the main one. Like you, though, I’d prefer a Fire WITH 3G. I’d never thought of using the Kindle for cookbooks — what a great idea! Thanks for this post. I’ve been on the fence for a while about getting one and this had made me more convinced that I do want one. Hurrah! 🙂 I’m pretty sure you won’t regret it …! I used to be a PhD student and I still got myself a Kindle. It’s convenient and saves you a ton of money (the entirety of the Project Gutenberg collection? Most stuff on Archive.org? Yes please!) and is really more practical in a crowded subway than a regular paper book. Paper books are still awesome but I tend to buy most of my books for Kindle now. It’s just fascinating to see the ramifications of the ebook and what it’s doing for publishing… we live in interesting, revolutionary times. I never thought I’d warm to e-readers either, but I have the Kindle app on my iPad and I love it for all the reasons you list above. Here’s another one – it eliminates the need for a book light. Plus, during vacations when my kids go to bed early and I want to read, I can! I just dim the light and have at it. I don’t have an iPad so it’s good to hear about the reading experience on that! The Kindle isn’t backlit, so you do still need a book light with it (though it’s easy on the eyes, at least). They aren’t amazingly cheap yet, sadly — the price does keep going down though! If you want to read the Kindle while it is charging, change the orientation of the screen by pressing the Aa button. If you don’t whether to get wifi or 3G, I highly recommend 3G. If you don’t have wifi connection at home you won’t be able to get books without doing a USB transfer. A USB transfer isn’t hard but does require a computer at hand to get the new book on your device. If you travel and want to be able to purchase, 3G is best. Wifi isn’t as prevalent outside of the US. Not sure you want to pay for books since Kindle can sometimes be as expensive as paper books? There are over 10,000 public libraries who are now working with Overdrive and Amazon to allow you to check out ebooks from your library and read them on your Kindle (even audio books that are not DRM protected). In order to do this you do need to have a wifi connection to get the books (3G doesn’t work) or if you don’t have a wifi connection you’ll have to use USB transfer. I do also recommend getting the extended warranty. Amazon is amazing about customer support and replacing devices but it’s a good idea to spend the extra money to get the extra coverage. Ah, cunning one with the screen orientation there! I agree regarding 3G — if there’s any doubt, go for it. Especially if you want to travel. I’m not sure how many libraries here in the UK are lending ebooks yet, but I’m sure it’s going to happen before long! I couldn’t live without my kindle, although, I have to admit that I still read the odd paperback from time to time. Maybe one in every 3 books is a paperback nowadays. You just can’t beat the convenience factor. The only bad thing I find is when I pull it out of my bag after 2 months of not charging it to find it flat! Makes for a very boring lunch without it. Thanks Josh! I still read paperbacks too … I’ve got a fair few that I’ve never got round to reading, plus second-hand paperbacks are sometimes cheaper than the equivalent Kindle books. And I’m not sure that giving an ebook as a gift is ever going to catch on! I love reading on the Kindle. I just got the keyboard-less $78 Kindle and its just amazing. I had not read in a few years except here and there. But now I am addicted. I also have a software called MobiCreator which converts my PDF books and documents into kindle format so I can make the text size bigger as I wish. Until I figured that out, I wasn’t too happy about the PDF feature but now I have made it work. My wife who is not even a primary English speaker loves to read on the kindle and loves the dictionary feature. Whoever says he/she can’t afford it or is on the fence is really missing out and should make money buy washing cars and get the new $78 Kindle. Great to hear that the keyboard-less one is working out well for you — thanks Jawad! I’ve had slightly mixed results when converting PDFs, but will have to give it a go with MobiCreator. I was morally opposed to the e-readers for the longest time, but when I finally broke down and let my dad buy me one for Christmas last year, I definitely had a change of heart. Now I rarely pick up an actual book and tend to get annoyed when the book I want to read doesn’t come in an electronic format. So, other positives: Easy to share books with friends if they have the same kind of reader. Also, I buy/download a lot of info products on the internet and now can carry them around and read them when I’m not at my computer. That’s all I got. but really, I am a big convert. My dad likes to point it out every time he sees me with the e-reader. It pretty much lives in my purse now. quick question – is sharing allowed once you’ve bought a Kindle book? Great Question! I never particularly cared to lend out my physical books. Never knew if I would see it again. Has anyone been able to figure out a way to get RSS feeds on their Kindle? There are subscriptions to RSS feeds in the Kindle bookstore. If the one you want isn’t there or you don’t want to pay your best best is to use an agregator and just use the experimental browser to retrieve them. There isn’t a way (to my knowledge) to have them delivered outside of a subscription. Studied literature myself. I love books but I’m looking forward to a kindle experience. It is worth a try since you mentioned that some of the classics may be available. Nothing wrong with it, I suppose, it is still reading. Thanks for the info by the way. I do love books and while I suspect I’ll always buy my non-fiction in hard copy (it’s still easier to refer to a paper book) I do find myself buying more and more fiction in electronic format. I don’t own a Kindle but I do use the Kindle app on my smartphone and it’s just as easy to get engrossed in an e-book as it is my paper ones. My only real problem with Kindles is the amount of precious minerals required to make them, and the subsequent Third World mining exploitation that happens as a result. If they can fix that, perhaps making Fair Trade e-readers, then I’d be sold! Icy, that’s a good point (and I guess, sadly, one that applies to so many consumer goods…) I’ve seen Fair Trade become a much bigger movement over the past couple of decades — hopefully it’ll start to make inroads in the ebook world too. I have both a Kindle 3 and a Sony Reader (PRS-500). 1. I don’t like the lack of native EPUB on the Kindle. I know I can email it across but that just isn’t how I work. A personal thing. 2. I don’t like Amazon. Their continual attempted power grabs throughout the publishing chain are a major threat to the book industry (not just meaning dead-tree publishers). 3. I like to *own* my books. If I buy from Amazon then I can read on any device that *Amazon* blesses with suitable software. I’m locked in to them. To move my Kindle purchases onto the Sony I had to break the DRM. I shouldn’t have to do that; they are supposed to be *my* books. I paid for them. Yes, EPUB often has DRM (Adobe usually) but they are not limited to one supplier’s choice of approved devices. So, if you love books then yes, get an ereader. Easier for the eyes and massively portable. Please, though, think carefully before going for the Amazon lock-in. KA, thanks for that! My aunt has a Sony Reader (I think) but I’ve not come across many otherp eople using them. I do agree with you about epub; I can’t see a good reason why the Kindle doesn’t support it. I’m hoping this will change in the future (along with the locked-in issue). I am in the same boat you WERE. I like reading, have a ton of books, shelves full. After reading your article, good article by the way, still not convinced. Books lasts forever and I am still wondering as I always have, how long a kindle? Although I admit, you have move me a step closer towards Kindle. Hm… on the one hand, you have a good point about hardware becoming obsolete (though, of course you can transfer ebooks to a new Kindle, or to your computer, etc). On the other hand … I’ve had books that have literally fallen apart after repeated reading! Ebooks can be read hundreds of times without any loss of quality. I was exactly like you and wrote about my experiences on my blog – the one you reviewed for me! Great posts! I know just what you mean about the “mug of tea” experience, too… (for me, having my favourite mug is part of the appeal as well). I agree with you and your friend that some books, we’ll still want in physical form. I certainly still buy “proper” books, but the Kindle is great for read-it-once stuff, or for books that I’ll want to reference while on the go. Hi Ali, seems a long time no hear since the blogging course. I have been out of commission but back on board now. Had been thinking about an e reader for a while now and your blog convinced me. Just got it out of the box and its great. Never thought I would take anything to bed apart from a man and a good book but now my kindle has replaced both! I am wanting to download my favourite blogs onto it. Is your blog kindle friendly? I may be in touch about some coaching down the track after I return from a long awaited break. Er, I have to confess, I’ve not used the Kindle at all for blog reading — Amazon lets you subscribe to certain blogs, but you have to pay for them. You can get Aliventures via that, but the information page is out of date — I’ll see if I can get Amazon to update it, and I’ll check out how it looks on my own Kindle! Just waiting for mine to be delivered, Ali…having that usual post purchase guilt, so very glad to read your post and be reassured I’ve done the Right Thing! Thanks, Jane! (Didn’t expect to see you round here!) We’ve had no regrets at all with our Kindles — except, perhaps, that we didn’t get them sooner…! 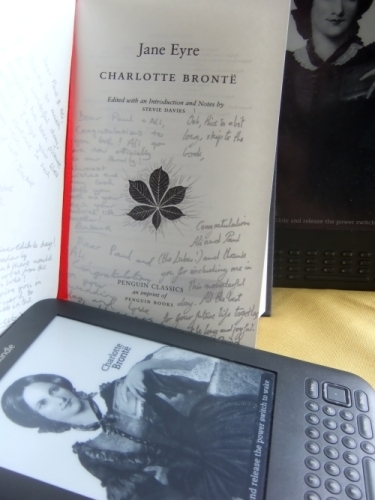 When ereaders came out I scoffed at them as an insult to ‘really reading’ a proper book. Then I was going on holiday in the islands and the idea of lugging extra bags, as we boat hopped and changed from place to place, didn’t thrill me so I decided to give an ereader a chance. I bought the Kobo and after finding it a bit odd for the first few pages of reading I soon got used to it and, absorbed in the story (Girl With The Dragon Tattoo), I didn’t think much more about the format. I downloaded quite a big list of books for the trip so I had plenty of choice depending on what my mood called for. In the past I would have been much more selective on what to take to reduce load. I do still buy all of my reference and research books in paper format because I like to have an easy to use index and I make notes and highlights in them (the horror!). But I also carry my Kobo everywhere and love having something to read if I find myself with a moment to spare (or wait). I have considered trading my Kobo for a Kindle so that I can download wirelessly but all of my current books are in epub format and I can’t bring myself to have to convert them all. Or be bound to Amazon. Kobo have brought out a new touch version so I might check that out and see if it has upgraded it’s features to match the functionality of the Kindle a little more closely. Thanks for adding the Kobo perspective, Rachael! I agree with you on buying paper books when you want to write notes and highlight … the Kindle does let me do this, but I find it a bit cumbersome compared with using pen and paper. I think all true book lovers go through this process. I did the exact same thing and was against e-readers for a long time. The main reason, of course, is I love books. I own far too many of them myself, love holding them in my hands and flipping the pages. The second reason, and maybe the secret true reason that I didn’t want an e-reader was because I thought eye strain would be an issue. I hate reading on my computer because my eyes get so irritated–buuuut, once I read about the Kindle’s E Ink, i was willing to give it a try. I think the interesting thing about all the comments is the resistance to ebook readers *because* people love books. I also love books, which is WHY I have an ebook reader. I have to honest that I cannot afford to book as many books as I’d like to read. I utilize my library A LOT as a result but it is difficult sometimes to find the time to get there and pick out books or return them. The addition of library reading on the Kindle has made it even easier for me to read library books. That said, indie authors are amazing! Without an ebook reader I would never have been able to discover some of these authors. Without this industry, these authors would likely never be published and our world would be missing some very talented writers. Yes, you have to separate the wheat from the chafe with indie writing but I’d rather spend .99 on a book and have it be horrible than $6.99+ on the same paper published book and have it be just as horrible. Being published by traditional publishing houses is in no way a guarantee that the writing is good. Maybe I’m cheap but reading is a part of my life and I cannot do without it. Having an ebook reader allows me continue reading voraciously without sending me to the poor house OR an episode of Hoarders. The ability to get new books for free or under $3.00 is a huge boon. Not to mention that when I buy ebooks from indie writers I’m helping them to live their lives and fulfill their dreams–even more than I am with a traditional published author. I’m sure you can tell I am a huge fan of indie writers and those who choose to self-publish. I am also a fan of the traditional publishing method BUT find that for our consumption needs it’s too slow and doesn’t pay for the writer (often). Tracey, great points about indie writers. I too like getting books for $2 – $3 and it’s great to know that a decent percentage of the money is actually going to the author! I’ve found that even the bestselling indie authors vary in quality — in fairness, I’ve read plenty of “traditionally published” books that were (to my mind!) in sore need of editing too, so it’s not just an indie issue! Above Samantha said one of the reasons book loves resist Ebook is because of the pure love for the printed book. I totally agree with her. But I think it also goes deeper. Much deeper than most book lover realizes. We love the whole industry. We are thankful to publisher who published the books. We love and are thankful to the stores, for giving us the experience of spend hours browsing. And we love and are very thankful to the author who wrote the stories we enjoyed so much. We even loved the coffee and pastries that we sat down with while reading a great book. We loved the whole industry, for the experienced it gave us. Craig_Os’s last blog post ..WE WANT MORE EBOOKS …WE ARE ALL DEMANDING IT ! That’s an interesting point, Craig — though most of those people (except the bricks-and-mortar stores) still benefit when we buy ebooks. I agree that the browsing experience isn’t the same, but in some ways it’s actually better — e.g. with ebooks, I can download the first 10% as a sample from Amazon and read it at home, rather than flicking through a physical book in a store. congrats on being married in a library. that was very interesting to read. are the images that you displayed in this post your own? i love the picture of dorian gray. i’ve read it almost thrice. will read it again. What’s the difference between an ipad and a kindle? Er… quite a lot! A Kindle is just for reading (and buying) ebooks and has very limited functionality beyond that. The Kindle Fire tablet would be more similar to an iPad. I suggest you look up a review of each to see what they do. Thanks. Actually I googled for such reviews before posting this question but didn’t get satisfactory results. Actually most reviews deal with the new features of latest version of kindle/i pad and compare it with their old versions. What is their core functionality – I didn’t find. Anyways I’ll search again. I own a Kindle and I value it for travel. I’ve also downloaded a lot of the free classics (who wants to carry around a copy of War and Peace?). I’ve also used it to download some recent books that I wanted to read immediately for one reason or another and to read some self-published books. However, there are a few reasons I will always treasure three-dimensional books: 1) I like to share my books — if I read something I loved and know someone who would also love it I want to hand them a copy and say “You should read this”, 2) I am a constant underliner and notetaker as I read. I know I can highlight in the e-book, but muscle-memory makes it so much easier to quickly review, i.e., I know it’s halfway down the page on the left, blah blah. I can scribble with a pencil faster than I can work the electronic highlighter thing, and finally, 3) how does an author autograph an e-book? 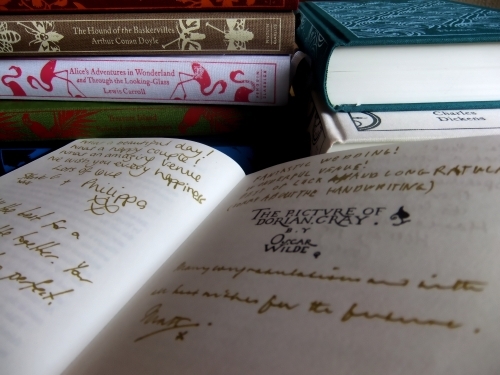 I have several books with personal inscriptions that I will always treasure. Can’t do that with an e-book. Yep, I’ve definitely been grateful for the Kindle when it comes to lengthy classics! Great points about why paper books are still handy: like you, I often remember where to find things by by page position. I’m hoping that some day, they’ll develop a way for authors to sign ebooks..! I love my Kindle. I’m an avid reader, so it’s perfect for me! I’m also the author of 32 romance novels and I’m selling some of them in Amazon’s Kindle Store (a lucrative endeavor!). I never thought my career would veer onto this path. Call me a happy camper. Good question, and one I’m afraid I don’t have an answer to! I live in the UK, where it’s rarely especially sunny (and if I was outside, I’d read in the shade). I’ve never had any problems with my Kindle due to overheating, but you might want to check around with other Kindle owners about that. Hi, I’m glad I found this, because I also love books and am currently in Spain and having a tough time finding the ones i want to read that haven’t been translated. I think the Kindle might be the answer. I’m also always interested in different recommendations of what to read. Is there a way I can subscribe to the blog (so that it arrives in my email)? Yep! Just scroll up to the top of the right-hand sidebar and pop your email address in the grey box (it’s under the red RSS logo button).